Our wishlist, big and small donations help build a warm welcome! 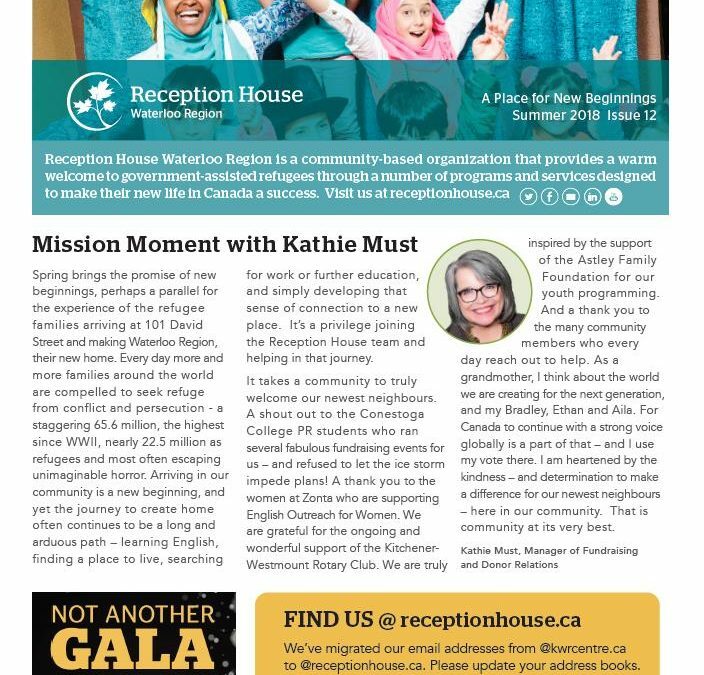 Find out what’s in store for World Refugee Day WR. Read the Summer Newsletter here. This morning, I want to focus on what we are doing not only as a profession, but also to look into it as an interaction between two human beings: us as service providers and those whom we serve- the service recipients that we call “clients”. As it’s defined in Reception House’s Mission our “programs and services assist refugees throughout their settlement and integration process allowing them to lead healthy and productive lives in their new community”. To achieve this, we work hard: managing the organization and the programs, doing outreach, fundraising, finding housing for the newly arrived, making sure clients’ needs are addressed and they feel empowered. If we put the professional aspect of our job aside, the essence of what we are doing is HELPING one of the most vulnerable group of people, enabling them to change their lives for the better. I think this HELP is the most rewarding and motivating part of the job. There is so much joy available when you know that you are having a positive impact on someone’s life. Seeing our refugee clients’ success, no matter how success is defined, gives us the feeling of success for ourselves. Because we had the opportunity to enable, encourage and promote them along the way. No doubt, that our greatest successes in life are often found in assisting others succeed. Here is an example of an intervention we made to help one of our refugee clients and how that intervention has gone a long way in improving his life. He himself is calling it a life-changing event. Other case managers have done it so many times before. The client is in his mid 30’s had been exposed to physical torture before coming to Canada and as a result had lost his teeth. He is young, but was suffering badly. The situation has affected not only his physical appearance, but his speaking ability as well. In addition, he wasn’t able to chew anything solid and was living just by eating soft food and consuming liquids. Whenever he smiled, he used to turn his face away. In short, he was suffering physically and emotionally from this condition. The process of getting him dentures has been very time consuming. Finally, we have managed it and he got the dentures. The cost of the dentures (more than $3000.00) has been paid through IFH, RAP Exceptional Allowance and Reception House discretionary fund has also been covering part of the ongoing cost. Having dentures has changed so many things for this particular client. He is saying that having teeth was like a dream for him that he thought would never materialized. Now, he is eating well, communicating well, smiling beautifully and doesn’t need to hide his face from others while talking or laughing. Seeing this client always reminds me of the value that comes from helping others. So, be proud of the job you are doing and always remember the old Chinese Proverb “If you want happiness for an hour, take a nap. If you want happiness for a day, go fishing. If you want happiness for a year, inherit a fortune. If you want happiness for a life time, help somebody”.